Unique and very well made.Love the bright colors.Great price! 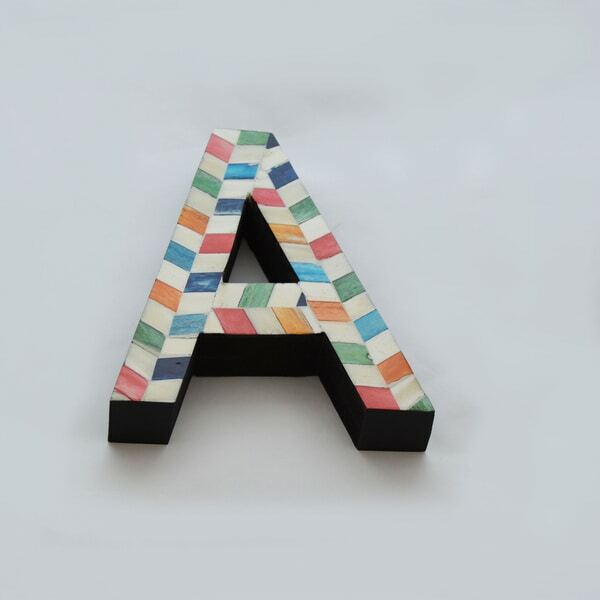 Add a pop of color to a shelf, mantle, or wall with one of these handmade letters. The chevron pattern features bone-inlay in cream and shades of pink, orange, green, blue, and yellow. This home accessory made from genuine natural materials using non-endangered species on a mango wood base. Story Behind the Art:This product line was inspired by our love of color in everything around us. Growing up in India surrounded by such beautiful fabrics, embroidery, art and accents inspired us to bring my love of these items into these products. I love this! It matches perfectly with the colors in my guestroom and is not too large. The tiles are genuine bone which gives it a high-end look. I may buy more! I ordered the letter C which I planned to place on a bookshelf in my living room. If you want to set the letter on a shelf, it is not possible with the letter C. There is a slightly flattened bottom, but it seriously seems like it is weighted to fall over sideways. I noticed on the first one I received and returned for another. This one was the same way. I kept it b/c I really like it. The pattern is really interesting and the colors seem even brighter in person. I have open shelves and I plan to hang it on the wall in my shelves. The colors on the letter were beautiful. It’s a nice accent piece to add to any room. The shipping was super fast! I would recommend it. Totally adore!!! This capital E letter I got is the perfect size, the perfect mix of bright, but not to overwhelming colors, and the bone makes it look more expensive, rather than cheap. LOVE IT!! Super cute & unique decor I snatched up for a great price. 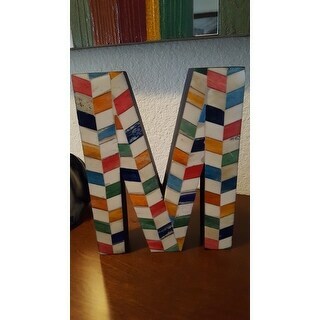 I bought the letter "M" with the intention of mounting on the inside wall above the front door (it comes with a key hole style mount in the back). It didn't quite fill the space like I'd hoped. It now sits pretty on our entry way shelf and looks great there also. Shipped quickly and arrived undamaged. The colors pop, it is solid and the material used is gives it an expensive look. Very happy with this find. These are better in person than picture on the internet. Great colors that literally match any wall color. They letters are quality made! I thought the size was perfect.... not too big but not too small! You were by be dissatisfied! the colors are true to the photos, bright and fun, and the product description is accurate. shipping was quick, as always, and the items were packed well. I really like these, but they were purchased as a gift, so I hope the recipients like them as much as I do! I'd recommend them. 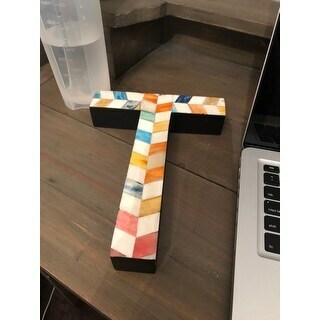 Received this bone letter in a "D" today, so so cute and yes, alot cuter than the boring ole plain white or metal, such a wonderful splash of color, this would make any area of any room in your home a little brighter. This is very well made and looks just as described in the photo. I love the colors. These letters are very beautiful, made very well and have the perfect amount of color to make them stand out, look rich and well made!! Love them and get compliments on them as you can either hang them or have them free standing.. I would by again as the go with anything decor and color scheme! these were better in person than I thought. pleased with my purchase. So very very very unhappy with this product it is very ugly in person and cheap looking. I have the o membership and it will cost me *** to ship back!!!! That is almost the cost I paid for this product very very unhappy will be calling customer service today. Extremely happy with this purchase. Even prettier than shown in catalog. "I really need an A to complete my daughter's name in these letters! Anyone know where I can find an A?" "behind each letter is there a notch or hook to facilitate wall mounting?" "How thick are the letters? Will they set on a shelf?" They look bright and fun!